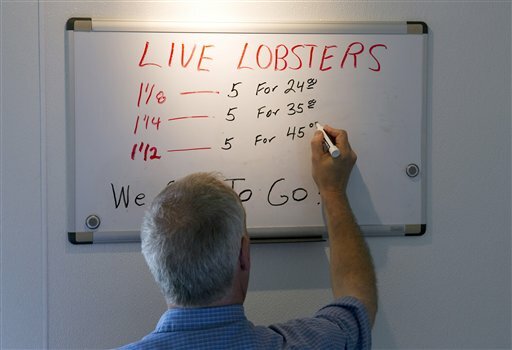 Bob Coppersmith updates the price board at Dock's Seafood Restaurant in South Portland dropping the price of five small lobsters down to $24 on Thursday, June 28, 2012. Many stores are selling the king of seafood for under $5 a pound, making it cheaper than bologna by weight. PORTLAND, Maine — A glut has driven down lobster prices in Maine — bringing cheer to lobster-loving consumers at the start of the state’s tourist season but gloom among lobstermen. 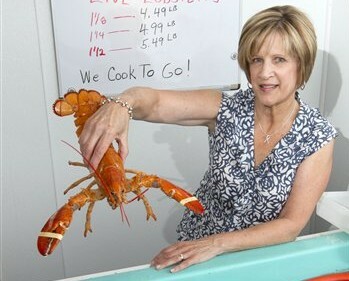 Retailers have been selling small soft-shell lobsters in the Portland area for an unusually low $3.79 to $4.99 a pound. At those prices, lobsters have been selling for less than the per-pound price of bologna at many supermarket deli counters. Zain Nemazie of Austin, Texas, was expecting low lobster prices — but not this low — while on vacation in Maine with his family. At Docks Seafood in South Portland, owner Bob Coppersmith said customers were eating up the low prices, including a deal where he was selling five small live lobsters for $25. He later dropped it to five for $24. The Fourth of July represents the unofficial start to Maine’s tourist season, when out-of-state visitors begin arriving in earnest. Typically, Independence Day also is when Maine’s lobster catch begins picking up as lobsters begin shedding their hard shells in favor of new soft shells. Soft-shell lobsters have less meat than hard-shell ones, but they are easier to crack open — it can be done by hand, no claw cracker needed — and sell for a lower price. This year, though, soft-shell lobsters began showing up in abundance in fishermen’s traps weeks earlier than normal. Most of those lobsters usually go to Canadian processors. But the processors haven’t been able to handle the Maine catch because Canadian lobstermen had such strong catches during their spring season, resulting in a backlog, said Neal Workman, head of The Fisheries Exchange, a Biddeford company that tracks prices, catches and other market information for the lobster industry. Supply right now far exceeds demand, resulting in a “perfect storm” for the industry, he said. “Things are plugged up,” Workman said. Virtually all soft-shell lobsters are sold to processors or on the local market, because they’re too fragile to ship long distances. The lobsters sold at retailers outside of New England are most often hard-shell lobsters, which command a premium price and are hardy enough to be shipped long distances. For now, the excess supply in Maine has driven retail prices to under $4 a pound for the smallest of the soft-shell lobsters. Larger lobsters, and those that still have hard shells, are more expensive. While consumers may be smiling, lobstermen are smarting because of the low prices — between $2.50 and $3 a pound — they’re getting for their catches. The fishing season is young and lobstermen are hopeful prices soon will rebound to their normal levels, said Patrice McCarron, executive director of the Maine Lobstermen’s Association. “The Fourth of July is a big boom in demand for us,” she said. “We’re going to see some lobsters move through the system, so there’s hope that we’ll see a balancing in the market once we get through the holiday demand and get back on track for a typical season. With Independence Day around the corner, Pete McAleney of New Meadows Lobster, a lobster dealer in Portland, was using the low prices as a marketing opportunity.